In 1863, while the kitchen at the Franciscan monastery was being restored, and then subsequently in 1906 a Crusade-era series of bronze and silver objects belonging to the Church of the Nativity were discovered in the city where Jesus was born. 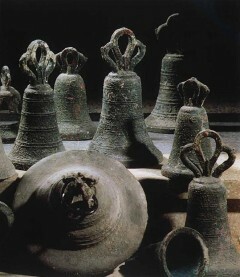 This is what was later called the Bethlehem Treasure, which also includes these bells. These objects have great value because they witness to the life of the Holy Land and its ancient history and this is why part of this history that is based on its roots throughout the centuries, even the Bethlehem bells will be part of the objects exhibited at the Terra Sancta Museum, the museum of Christian origins promoted by the Custody of the Holy Land and coordinated by ATS pro Terra Sancta. Presented just a few days ago in Milan, the projects plans on opening its three new exhibition areas on two different sites to the public by 2015. Video produced by the Franciscan Media Center.